The 19ft High Terrain by Atlantic Caravans combines form with offroad function. They don’t call the north Melbourne suburb of Campbellfield the caravan manufacturing capital of Australia for nothing. Drive along of the industrial side streets and you’ll spot sign after sign announcing the factory of many popular caravan names. In amongst them: Atlantic Caravans. This unassuming manufacturer has been in the game since 2010, offering a range of blacktop tourers, bunk vans, and offroaders. Steadily, Atlantic Caravans has made a name for itself. In January 2018, it launched a dedicated offroader, the High Terrain. This model, I’m told, has since become one of the manufacturer’s top sellers. The High Terrain is, so far, available in two main variants: a 19ft tandem-axle rig, and a single-axle 17-footer. Both are available in single-bed and queen-bed layouts. In a number of respects, the 19ft High Terrain, which we hitched up for a run to one of our favourite bush campsites in Victoria, is an appealing package. At $79,990 (as shown, ex-Melbourne), it offers decent bang for buck, too. Now, I’m the first to admit that our tow vehicle for this review is not ideal. The Isuzu MU-X can haul 3000kg, with up to 300kg on the towball. Our High Terrain weighed 2770kg (Tare), so we were legal, but obviously if we had’ve filled the water tanks, the gas cylinders, and tossed in some provisions, we would almost certainly have exceeded the vehicle’s towing capacity. We therefore don’t endorse the MU-X as a suitable tow vehicle for this van, but this was an opportunity to test how well our new vehicle performed with a heavy load on the back. Instead, a Jeep Grand Cherokee or 200 Series Land Cruiser, with their 3500kg towing capacities, would be ideal for a van such as this. However, the High Terrain towed well as we took the Hume Highway north, never swaying or behaving erratically. And as the bitumen gave way to gravel and undulating mounds of dirt, the High Terrain, with its high ground clearance, faithfully followed, articulating on its DO35 coupling. In soft sections, the MU-X spun its wheels slightly but, in low range and with a bit of throttle, it hauled the High Terrain to safer ground. The van has a large checkerplate storage box on its 6in A-frame, behind a mesh stoneguard. It comprises a decent storage compartment, a couple of jerry can holders and, on the offside, a slide-out tray for a generator or portable fridge. The onboard (optional) diesel heater’s fuel tank sits in a checkerplate holder mounted to the front of the storage box. It’s worth pointing out that Atlantic has taken the time to shield vulnerable components. Although the gas regulator, for example, is already behind the mesh guard, Atlantic has shaped some checkerplate around it. The dual 95L water tanks are protected, too, as is the grey water tank. Now, I’ve seen my share of vans with unprotected grey water plumbing, so I was particularly glad to see the armour plating surrounding the PVC. The grey water tank’s outlet appeared to be the only unprotected component. The High Terrain comes standard with dual 120Ah AGM batteries, which are mounted in a steel box to a chassis rail, behind a hinged door – access is very easy. The dual 150W solar panels on the roof should keep you in 12V power for days on end, and of course, the batteries can also be charged off the tow vehicle via an Anderson plug. An Anderson connection is fitted to the nearside chassis rail, too, so you can ‘chase the sun’ with a portable panel. The High Terrain doesn’t have an ‘entertainment hatch’ (i.e., a nearside compartment with TV arm and relevant connections); however, it does have an aerial and nearby 12V and 240V points, so you could rest your portable telly on the fold-down picnic table. It does, however, have a Fusion sound system (our van was fitted with an optional upgraded unit), with dual speakers outside and a couple inside, too. Sensibly, the stainless steel Swift slide-out kitchen is not under the awning, allowing you to fit annexe walls without running afoul of regulations that require adequate ventilation for external barbecues. A shower, rear-mounted spare wheel and a full-length roll-out awning are among the other external items you’ll find on this van. The Atlantic Caravans High Terrain is built on a 6in SupaGal chassis built by Road Runner, the same company that builds the 3.5-tonne OzTrekker suspension. This is a leading-trailing arm coil system that uses a single shock absorber per trailing/leading arm. While obviously we didn’t haul this van along the Gibb River Road for weeks on end, during our time with it, which included various terrain types, the OzTrekker outfit acquitted itself well. Our High Terrain’s layout was quite conventional, with its front bedroom, amidships kitchen and dinette, and full-width rear bathroom. A number of features, however, stood out. The bedroom had the usual items, such as side wardrobes, overhead cabinets, reading lights and powerpoints, but beneath the mattress was a unique false bottom that covered the diesel heater. The kitchen offered a workable amount of bench space, especially with the hinged section of bench over the four-burner cooktop. Among the cupboards and drawers, the High Terrain offers a large pots and pans drawer beneath the 184L Dometic fridge-freezer. Meanwhile, there’s no shortage of overhead locker space. The microwave is recessed into the overhead cabinetry, close to the Fusion sound system. And, naturally, there’s a stainless steel rangehood above the cooktop. The cafe-style dinette comes with a tri-fold table, nearby 12V and 240V points, and lockers above; however, one locker is home to the BMPRO BatteryPlus 35 battery management system and Trek digital display, which gives at-a-glance information on battery and water levels, and more – it’s a good unit. In terms of size, the bathroom is about what you’d expect in a 19-footer. Not huge. Not cramped. It has an offside cassette toilet with a front loader washing machine above, a central vanity unit, and a separate moulded-fibreglass shower cubicle on the nearside. It’s all quite conventional, and quite attractive. A general comment: the cabinetry throughout the High Terrain appears to be carefully constructed – I saw no poor joins or splinters – and it certainly offers adequate living space for two people. 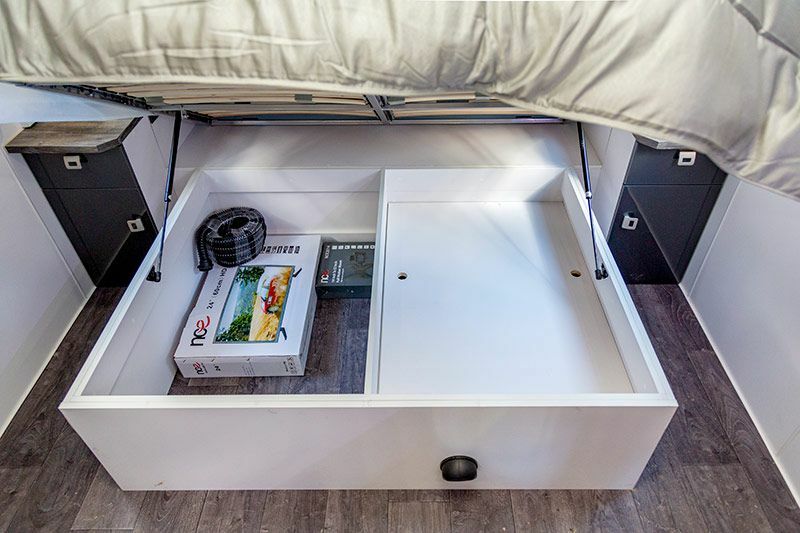 I’d prefer drawers rather than ‘hatches’ for the storage space under both dinette lounges, but other than that, I found very little to complain about. The Atlantic Caravans High Terrain definitely seems fit for purpose. Though with its meranti timber frame and composite aluminium cladding, it doesn’t break new ground in terms of construction, it does pay heed to the offroad-caravan essentials: component protection, adequate fresh water and 12V power provision and, dare I say it, creature comforts. Atlantic even includes Cooper all terrain or mud terrain tyres. Yes, it will need a substantial tow vehicle (MU-X owners need not apply), but the High Terrain appears as though it would be a dependable home on wheels in the bush or the outback.